ONLY A SUPER GROSS PERSON READS ANOTHER PERSON's DIARY -- unless absolutely necessary. *What are some ways in which you've really grossed yourself out? *If you could give Angeline a makeover, what would she look like? Draw it! *If your crush sent you a love note, what would it say? Contemplate life's deepest questions with Jamie Kelly. Fill in your answers to these questions and more, then pass the book on to your friends. 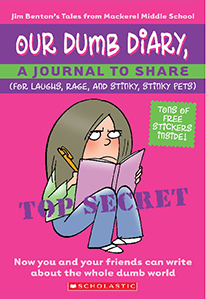 Your Dumb Diary is a journal to share with your BFFs! BONUS FUN: Jamie's top-secret tips for surviving middle school and Isabella's metric system of Dorkology!